Whether you operate two screens or two thousand screens, MobiCinemas connects you to all your customers with show times, promotions, ticket purchase, rewards, and even concessions ordering all on your app. The cloud-based system is flexible, easily customizable, and can have your branded App in the app stores in days. Providing an app to your guests should do more than just show them a schedule. 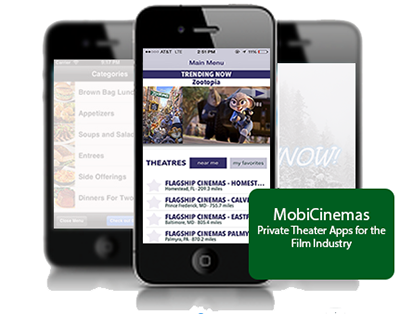 With a MobiCinemas app, you engage your guests to enhance their experience at your theaters. 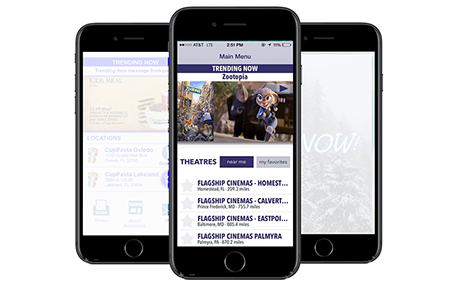 Allow your guests to easily access Theater information, App Rewards, Movie information, and more!